America, Europe and the Future of the Global Economy, is the subtitle of the new edition (cover on the left above). The original, 2011, edition’s subtitle was America, the True Causes of the Financial Crisis and the Future of the World Economy (cover on the right above). In this remarkable and provocative book, Yanis Varoufakis explodes the myth that financialisation, ineffectual regulation of banks, greed and globalisation were the root causes of the global economic crisis. Rather, they are symptoms of a much deeper malaise which can be traced all the way back to the Great Crash of 1929, then on through to the 1970s: the time when a ‘Global Minotaur’ was born. Just as the Athenians maintained a steady flow of tributes to the Cretan beast, so the ‘rest of the world’ began sending incredible amounts of capital to America and Wall Street. Thus, the Global Minotaur became the ‘engine’ that pulled the world economy from the early 1980s to 2008. Today’s crisis in Europe, the heated debates about austerity versus further fiscal stimuli in the US, the clash between China’s authorities and the Obama administration on exchange rates are the inevitable symptoms of the weakening Minotaur; of a global ‘system’ which is now as unsustainable as it is imbalanced. Going beyond this, Varoufakis lays out the options available to us for reintroducing a modicum of reason into a highly irrational global economic order. An essential account of the socio-economic events and hidden histories that have shaped the world as we now know it. Congratulations for your book. It gave me a great insight of how the global economy worked from 1900 onwards and the big probability of global imbalances and tensions developing in the short-term. Great! Only one question: I would like to know if the book will be translated in italian. When will it happens? If it will be I’d like very much to recommend this book to my friends! Let me know, please. Yes, I believe an Italian publisher has purchased the rights and the translation is progressing. just a few hrs ago i received the book.Its very very interesting so far,congratulations. Ive just finished reading the part where you are describing the 3 toxic theories.I have a question regarding the Real Business Cycle theory. Cant this theory be true up to a point?In the case of Greece for example,considering that there is no government intervention (the austerity measures are a type of intervention) wouldnt the economy balance (meaning the recession would be a lot “softer” than now,if not non-existant) at least up to a point through the “help” of automatic stabilizers? They exist by nature of the system and they require no intervention in order to work! Just to inform you: The last Issue of the Books’Journal contains my extensive, benign and critical review of your “Monotaur”. I have enjoyed both to read it and to raise some critical points. Great. Where can I see it? Is it available online? Thanks for keeping the book accessible to the layman. Enjoyed it immensely. Don’t understand why more academics don’t take the time to write for the rest of us. We’d pay. As I would hate to wait for the bok to come over mail. Can I buy it in any bookstore in Athens this weekend? The Greek version is available in all bookshops. The English only in Πολιτεία. Any chance to get the book in Kindle? 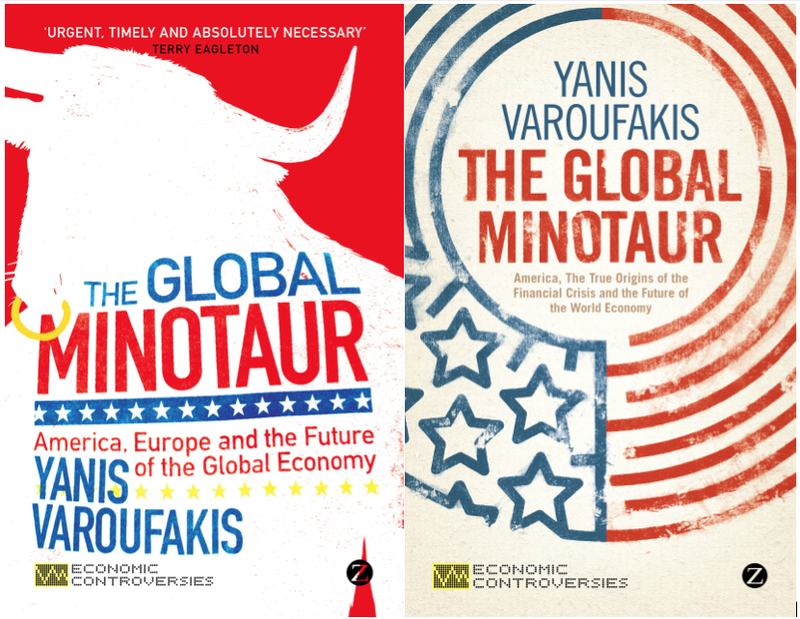 [To download an e’book version from Waterstones, in EPub format, click http://www.waterstones.com/waterstonesweb/products/yanis+varoufakis/the+global+minotaur+28ebook29/8709634/. Please , when the book’s tranlation into Spanish ? Not sure yet. Will keep you posted. Hi, will your book be available as an Audio book Unabridged in English. Very handy for the MP3 player. P.S. You have the perfect voice for it too may I say.Cheers. ich freue mich sehr das es noch Leute gibt in Griechenland die noch genügend Intelligenz, Patriotismus und Mut haben um die Wahrheit zu verbereiten ! The book decrypts with a unique methodology the complex driving forces behind the 2008 global economic crisis, not found anywhere else. Never before, since the start of the crisis, I’ve found such an unbiased and open minded information as to how and why this global financial chaos took place. The content analyses in a simple yet accurate way the complicated mechanisms that contributed to the today’s fatal economic decomposition across all societies. Thank you Professor, for putting your effort to write such an outstanding book for the general (non-professional) public. The book looks very promising judging by the reviews! Is the Greek edition offered in electronic format as well? I wasn’t able to find any sites offering an epub version. Can the status quo in terms of the twin deficits of the United States be maintained, at least theoretically, without the Global Minotaur? 1. The US Government, as a sovereign issuer of its own fiat currency, can technically afford to purchase anything that is for sale in US dollars. The US Public Sector does not actually finance itself through the bond market, nor does it rely on any foreign entity, public or private, to provide it with funds. The US Government cannot go broke. Liquidity does not technically have to be “recycled” into the US for the country to run a Public Deficit (G – T) which supports the Trade Deficit (X – M). 2. In terms of the US Private Sector, banks can and do create money (loans) out of thin air. Loans create deposits. What banks mostly need to create loans are credit worthy customers… not reserves, not liquidity from overseas. Therefore, and again, liquidity does not technically have to be “recycled” into the US for the Private Deficit (S – I) to help support the Trade Deficit (X – M). Considering the above, do you agree that at least theoretically the absence of a Global Surplus Recycling Mechanism does not “necessarily” imply that we cannot continue further along this dual deficit path, for better or worse, just because an international funding loop has been broken or is being eroded? Am enjoying the book, have made it half way through. Though now seeing news reports of bankers and politicians talking of recovering and returns to stability without promise of change terrifies me. Thank you for your book. I have just finished reading the 2013 edition. Your thesis is certainly interesting: it could help us, especially us who have no extensive knowledge in economics, understand much that is happening in world economic and political developments. It is a deep but flowing text and demonstrates your wide knowledge and deep culture. It is a real treat. I am looking forward to the study of your more demanding book, (with Halevi and Theocaracis), “Modern Political Economics: Making sense of the Post-modern World”. Congratulation for the “Global Minotaur” !!! congratulations for your new job in the Greek government. It will be interesting to see how much of your ideas and approach to economy you can apply (or, should say, “you are allowed to apply by the powerful (EU, banks, German government, and a long etcetera of people that might be looking forward to prove you don’t have the power to implement real, meaningful changes). I hope you prove them wrong, and can make things better for the Greek people! by the way, would it be possible to get a digital copy of your books The Global Minotaur and the Game Theory A critical introduction? i saw on other posts you were willing to send them, so hopefully it’s ok for me to get them as well. Thanks! I wish you all the luck in the world I just finished wachting your interview with the BBC newsnight I enjoyed it a lot.Lot of people in Holland are watching all the development in Greece because we also are getting weary from the austerity meausers taking place here .